We continue our series on the top draftable players entering the 2013 season. Today we discuss the wide receivers. The NFL is a passing league now and teams need as many top wide receivers as they can get. No longer can you get by with just one top notch receiver. You need two, three, even four if you can get them. Here are our top five. 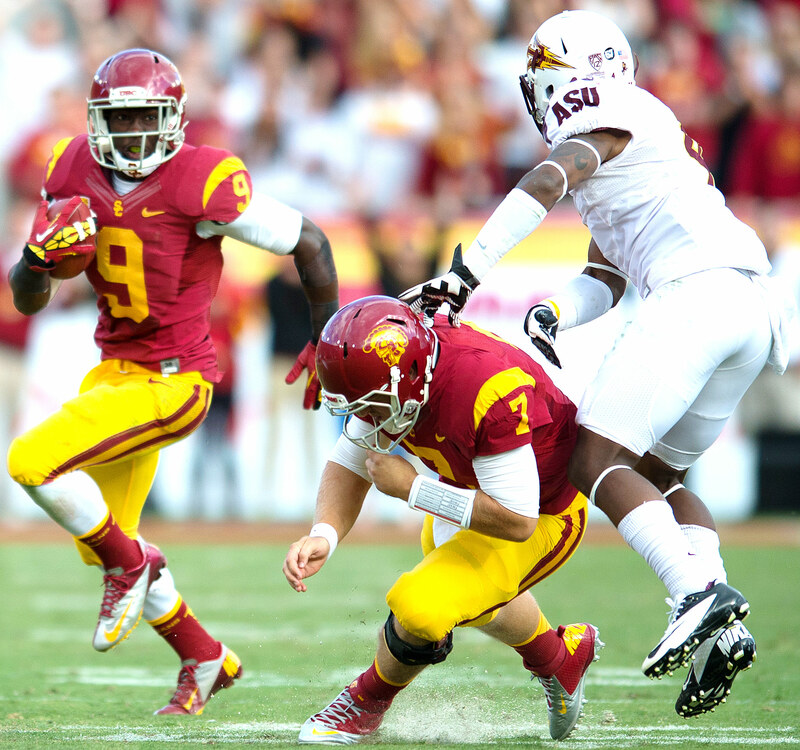 Marqise Lee burst onto the scene in 2011 as a freshman. In his last five games as a freshman, he caught at least 7 passes per game and he ended the year as the Trojans second leading receiver behind Robert Woods. Last year, Lee became the go-to receiver for Matt Barkley and he led the country with 118 receptions. He was second only to Terrance Williams of Baylor with 1,721 receiving yards. Marquise Lee is a former track star and has become the playmaker of the USC offense. Lee runs precise routes and has good explosion off the line of scrimmage. He has great acceleration and vision once he makes the catch and he has the ability to make people miss. Lee has very good hands and has the ability to go up and catch the ball over a defender. He has elite body control while in the air and along the sidelines. A surprising aspect of Lees’ game is his physicality and willingness to block. The Trojans also used him in the return game and Lee averaged 28.5 yards per kickoff return and had 1 TD. Lee is one of the front runners for this years’ Heisman and should he decide to declare for the draft should be an early pick. Sammy Watkins is another receiver that made a splash in his freshman year. Watkins was a 1st team All-American in 2011, leading his team with 83 receptions for 1,225 yards and also added 826 kick return yards. He led the ACC and was #4 in the country in all-purpose yardage with 2,291 yards. Last year started off slow for Watkins as he was suspended or the first two games and missed a third game with an intestinal issue. Most receivers would love to have 57 catches in a year, but those aren’t Sammy Watkins type numbers. The absence of Watkins forced quarterback Tajh Boyd to find another go-to receiver and DeAndre Hopkins took advantage of the opportunity, leading the team in receptions and was a 1st round draft pick of the Houston Texans. Watkins will be looking to get out of the gates quickly this year and with Boyd still around at quarterback, he should be able to do that. He is an electric layer that racks up yardage after the catch. Watkins has blazing speed and an amazing ability to make cuts without losing speed. Once he is in space, he is difficult to catch and bring down. Watkins is a smart receiver that can use his athletic ability to make a corner bite and run past them on a double move. I look for Watkins to once again get in rhythm with Boyd and put up amazing numbers this year. Jordan Matthews had a record setting year for the Commodores. His 94 catches led the SEC and were #2 all-time among SEC players. His 1,323 yards were second in the SEC and set a single season school record. Matthews also set a school record with 7 games over 100 receiving yards. Quarterback Jordan Rodgers graduated, but his replacement will have experience as a college QB. Senior Austin Carta-Samuels was a starter for Wyoming before transferring to Vandy. Matthews will need to develop chemistry with the new signal caller and will be asked to become the leader of the offense. Jordan Matthews has decent straight line speed, but doesn’t have elite quickness. He has great hands and he does a good job extending his arms and snatching the ball away from his body. Matthews uses his size to catch the ball at its highest point and box out defenders. He has a wide catch radius allowing him to adjust to poorly thrown balls and he does a good job catching in a crowd. Mike Evans led the Aggies with 82 receptions for 1,1105 yards (both SEC records for a freshman) and 5 TD last year. When Johnny Manziel got in trouble (on the field), he usually looked Evans’ way. Evans is a huge wide receiver (6’5” and 225 pounds) and he does a great job of using his size to his advantage. He excels at making catches at their highest point and can make acrobatic catches. Evans has great body control and I look for the Aggies to look for him more often in the red zone his year. Because of his size, it’s difficult for a defensive back to press him. Once he makes the catch, he is tough to bring down and he does a good job fighting for extra yards. Evans is a former basketball player that is still learning the game and his upside is scary. Assuming Manziel doesn’t lose any time due to suspension, Evans should put up incredible numbers this year. Ryan Swope has gone to the NFL, so Evans shouldn’t have as much competition for the ball. Brandon Coleman is another massive wide receiver. He is listed at 6’6” and 220 pounds. He was 2nd team All-Big East in his first full year as a starter and should be even better this year. Coleman was the Scarlet Knights’ big play receiver, leading the team with 718 receiving yards and his 10 touchdowns tied a school record and led the conference. He also averaged over 17 yards per reception. Quarterback Gary Nova has another year under his belt and he should hook up with Coleman early and often this year. Like Evans, Coleman is also hard to press. He is explosive off the line and uses his agility to quickly create separation. Coleman does need to work on his consistency. He shows good hands at times, but then loses his concentration and drops an easy pass. Route running is another area that Coleman can work on, as he sometimes rounds off his routes. These are both areas that can be improved with more experience. NFL teams will love his size and ability to get into the end zone. The other things can be improved through hard work and coaching. This entry was posted on August 17, 2013 by draftmaniacs in Top 5 at each position and tagged 2014 NFL draft, Clemson Football, Jordan Matthews, Marqise Lee, Mike Evans, NFL Draft, Sammy Watkins, Texas A&M football, USC football, Vanderbilt football.